Looking north over Lago Grey toward Glacier Grey. Torres Del Paine National Park is located in Southern Patagonia, a couple hours north of Puerto Natales, Chile. The W-trek is a route through the park’s contrast of colors: jutting grey stone pillars, dark black jagged peaks, turquoise glacier lakes, deep blue spine-riddled glaciers, luscious green foliage and vibrant red fire bushes. Patagonia as a whole is an ancient landscape formed by glaciers with little human structures or inhabitants. A land with no dangerous predators besides the mountain lion, ruled by the domineering weather and its famous wind. 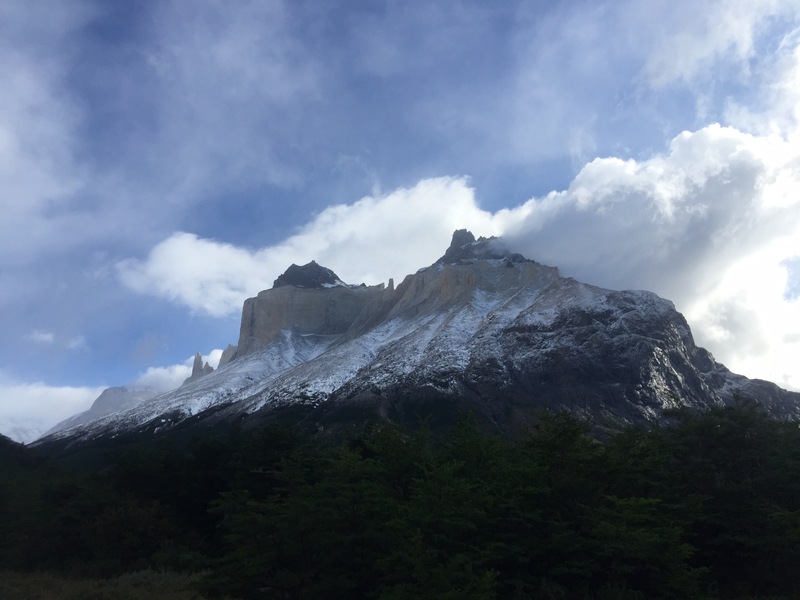 Patagonia has a deep connection with backpackers and climbers, however its rawness in Torres Del Paine and elsewhere has been tamed. 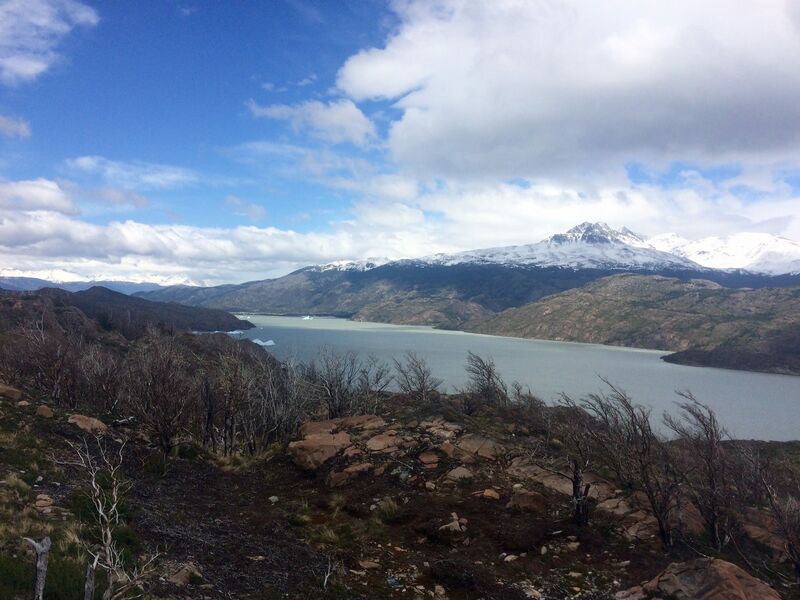 Torres Del Paine still has all the beauty of Alaska, but it now has the convenience of Yosemite. If you are an avid backcountry camper who enjoys remoteness, the W-trek might not be for you. 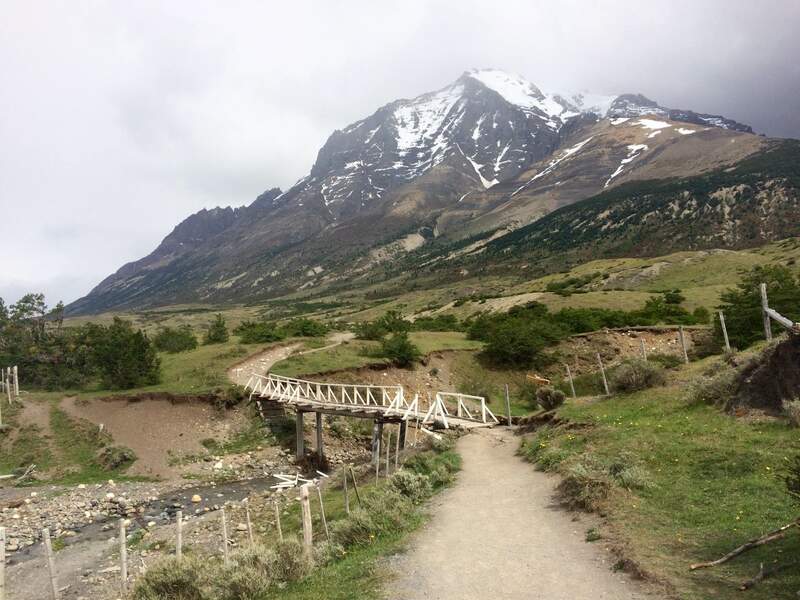 I still really enjoyed my trek and definitely recommend going to Torres Del Paine, but I felt the refugio experience took away from the primitive nature experience I’ve come to expect backcountry camping. If you are like me and enjoy wilderness I recommend the O-circuit, skipping the Fantastic Sur regions (only visiting Glacier Grey and Valle de Francis) or going on less traveled areas such as up to Campemento Paso like I did or to trying going to Mirador Zapata. 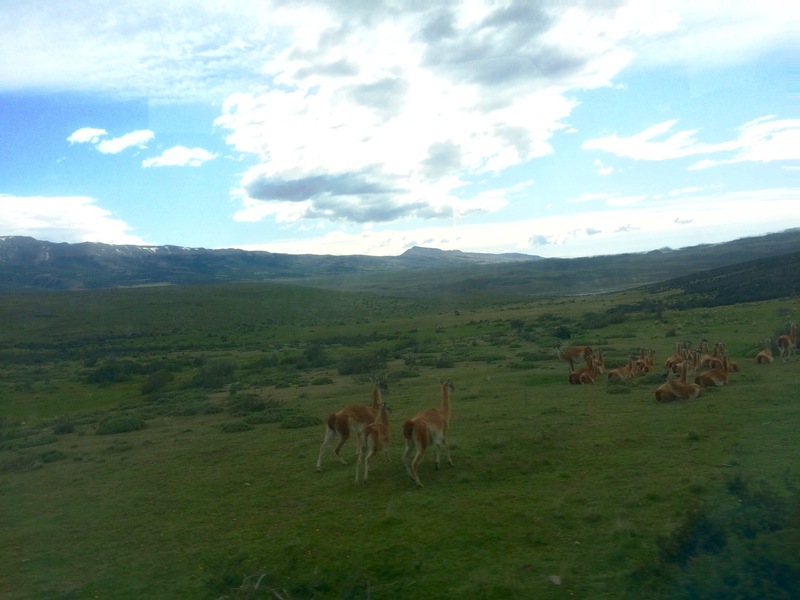 Herd of Guanacos just before administration to the park. After exiting the Las Torres bus, our hike started at the Las Torres trailhead next to the large Las Torres hotel. 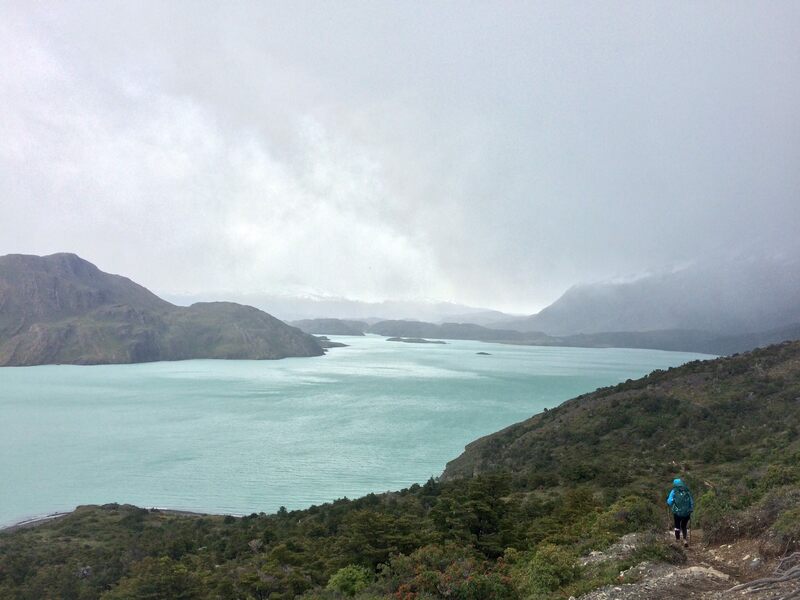 We were treated with sprinkling rain as we hiked the trail up towards Valle Ascencio. Upon rounding the ridge into the valley the wind became gusting, moving us around. However, after entering the valley a bit the wind died down and in another half mile be we saw Refugio Chileano off a turquoise river flowing out from the valley. Upon viewing Chileano the rain increased. Reaching the refugio, we waited inside the Refugio Chileano in a line of five people to check in. We found out that our campsite reservation was on a wooden camping platform which was equipped with specific nails and metal loops only for the refugio’s specific tents they rent. Unfortunately the platform also was wide enough where we couldn’t reach dirt with our stakes. This was unexpected and unfortunate since I didn’t not bring enough chord to tie down correctly to all the nails/loops. As a result, I was unable to stake in my rainfly’s guy lines and had more moisture on my tent wall than I liked. After using the high wind, first stake down your tent, then erect strategy our tents were up and it started to rain more. Base de Las Torres. No towers for us, only a beautiful snow and an alpine lake. Excited by our first day in the park we decided to go up to Base de Las Torres after lunch with day packs. 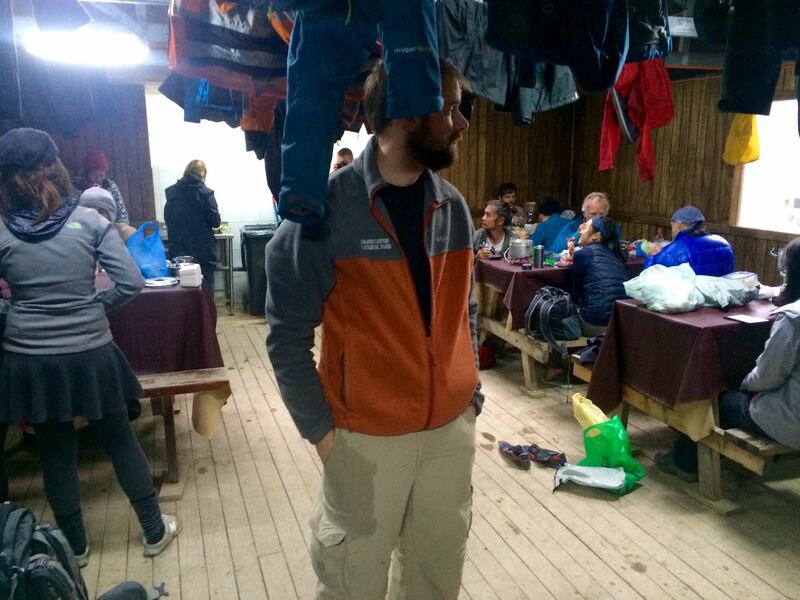 The weather hadn’t improved and eventually my rain resistant pants would soak through, I should have brought rain proof ones… We passed a number of somber looking backpackers with packs hiking up to the free campsite of Campamento Las Torres in the rain and mud. Once we arrived to the Las Torres Campsite we took a left and headed up a steep rocky slope towards the torres (towers). Near the top of the ridge the rain transitioned to snow and by the time we made it to the alpine lake (above) the sky was full of puffy white snow coming down like in a Christmas movie. It was very beautiful to be alone in that scene despite that we couldn’t see the towers due to the weather. However, we couldn’t stay long. The cold air on my wet pants took the warmth out of me and we had to be back in time for our dinner seating at the Refugio. This hike introduced us to how uneven and rocky the trails would be in the W. One person’s knee started hurting a lot on the way down. Arriving back to the cooking hut we warmed up and dried off best we could amid a bustle of people hanging clothes, cooking food and sharing stories. The cook hut was busy and a great community experience where I met a ton of interesting people this night. Soon it was time for dinner and we enjoyed a warm chicken entree and went to bed in our tents. The next morning the cook hut “opened” at 9am and since we wanted a warm breakfast we got on trail late this day. The sky continued to rain, but the weather significantly improved once we left Valle Ascencio and started West towards Campemento Cuernos. The hike along Lago Nordernskjold was beautify with the contrast of the turquoise lake, the deep green mountains and the dark brown dirt. We even got to witness a small cyclone spinning out the bay near Mirador Cuernos (near that island in the picture above). Reaching Cuernos I waiting in a eight person line (all were ordering Pisco Sours) to check into my campsite. Setting up our tent in a forested area we found a pool of water inside of it since we packed it wet. Using a cup and a rented towel we dried the interior. Soon it was time for dinner which we ate at the refugio. Afterwards, laying down in our tent our ears were greeted by the sound of a drunk party of men singing late in the evening (10:20pm) from the cook hut. The party was so loud it sounded like yelling at a football game. During the night the wind howled loudly and our friend’s tent poles ended up pushing in significantly. A couple of his stakes also came out. Our spot in the forest however was barely buffeted by the wind. 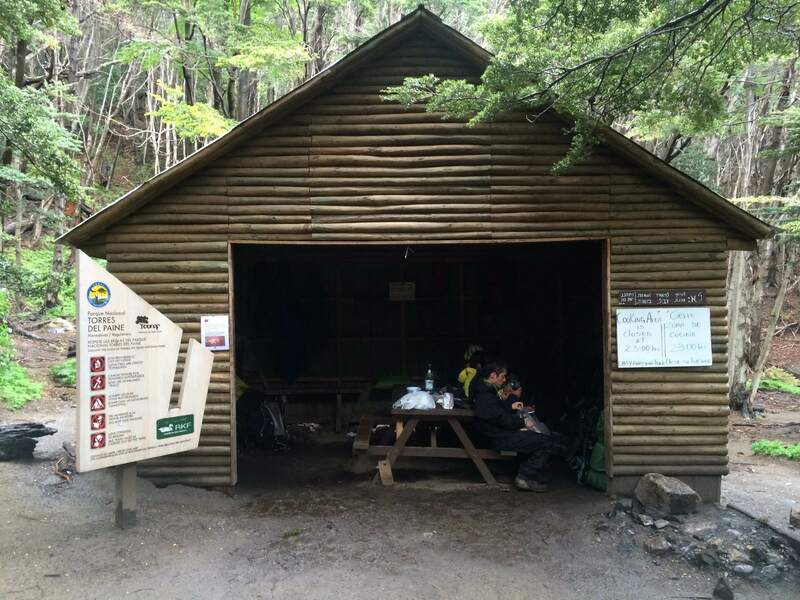 The next morning we came across six people sleeping in the cook hut. A jumble of wet tent by the door. It looked like they got soaked and their tent broke during the night. I definitely heard other people mucking with their tent in the early hours and we met someone later the next day who said they lost four stakes. I guess this is why most tents here are mountaineering tents. It was a short hike to Campemento Italiano which was situated besides a large river used for drinking water. The site was simple and quiet. A reprieve from all the noises of the refugios the last two nights. For the third day in a row it rained most of the day. Upon check in we were told Valle del Francis was “closed” after the Glacier Francis mirador due to high winds (80 km/hr) and snow. We took this picture the day after. This is what we would have seen in the French Valley if it wasn’t raining. 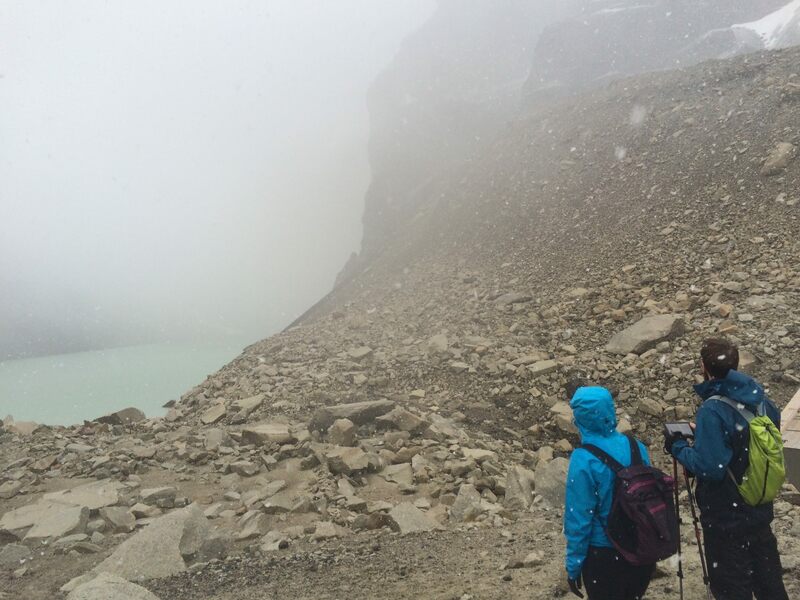 Taking just our day packs it was a good hike up to the Francis Glacier mirador. Your first sight is of a glacier (not Francis) with a meltwater river flowing out of it. 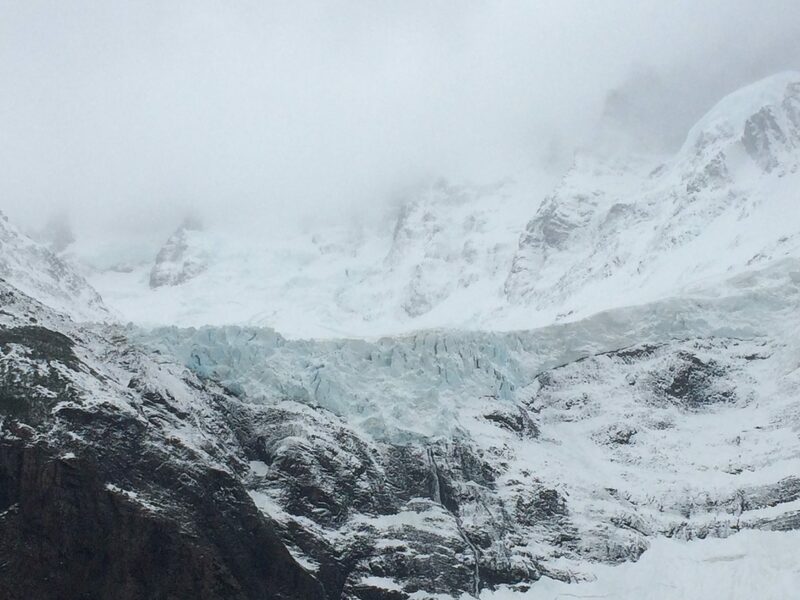 After a few hours you start to see into the first bowl of Valle del Francis in which the Francis Glacier resides. The wind was strong here as we stood in awe staring at the the beauty of a mountainside glacier dropping into another glacier below it. While we watched we were able to witness a small avalanche. We looked up towards the “closed” path to Britanico, but could tell all we would experience was slippery rock, snow and poor visibility. Learning from our first day we turned around instead of plunging into the wet, cloudy trail. Back at camp, laying in the tent we heard avalanches that sounded like thunder throughout the night. Including one strong one that went on for seemingly 30 seconds. From Campemento Italiano it is an 11 mile, 2100 ft elevation gain hike to Refugio Grey. This is the area of the park most affected by the past wild fires in Torres Del Paine and many forests were merely tree graveyards. The Vertice operated refugios we saw this day resembled much more beautiful hotels rather than the lodges of Fantastico Sur and the campgrounds were also much larger with many more tents. Our spirits were high after three days of wet, cold weather as we finally received partly cloudy sky and little precipitation! Halfway up the Lago Grey we started seeing ice chunks in the lake. A short while later we reached the Refugio Grey, completing our W-trek and checked into a refugio room containing two bunk beds. We aired out our wet tents and clothes and relished in a warm, dry sleeping arrangement. A room over our heads was well enjoyed since it started raining heavily later that night. Instead of leaving the next day I wanted to go up towards Campemento Paso as a day hike since I wanted to hike alongside Glacier Grey. This was the best decision I made on the entire trek. Contrary to the rest of the W where we saw people at least every ten minutes, we hiked alone for four hours only seeing a dozen people who had come over the pass after that. 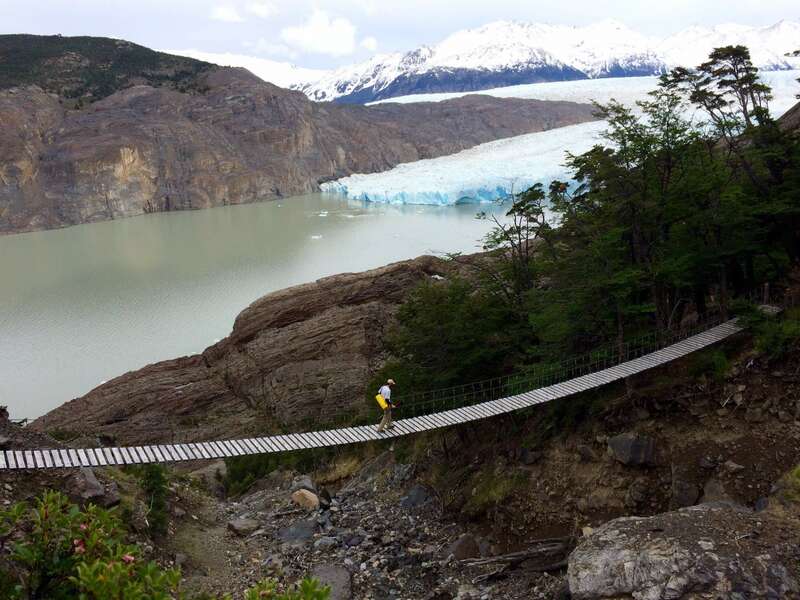 We also encountered two exciting 150-200 ft long suspension bridges, one 40 ft ladder, fresh mountain lion tracks and a wonderful expanding view of the Glacier Grey as we hiked further and further alongside it. Even better there was no wind and almost clear sky this day! Our goal was just to day hike as far as we could and I think this leg of the trip may have been my favorite hike of Torres Del Paine. Followed by our hike to Glacier Francis. The following morning found us waiting around for the Grey II boat which would take us from Refugio Grey, on a glacier tour and then back to Hotel Lago Grey. The view of the glacier up close as very beautiful. 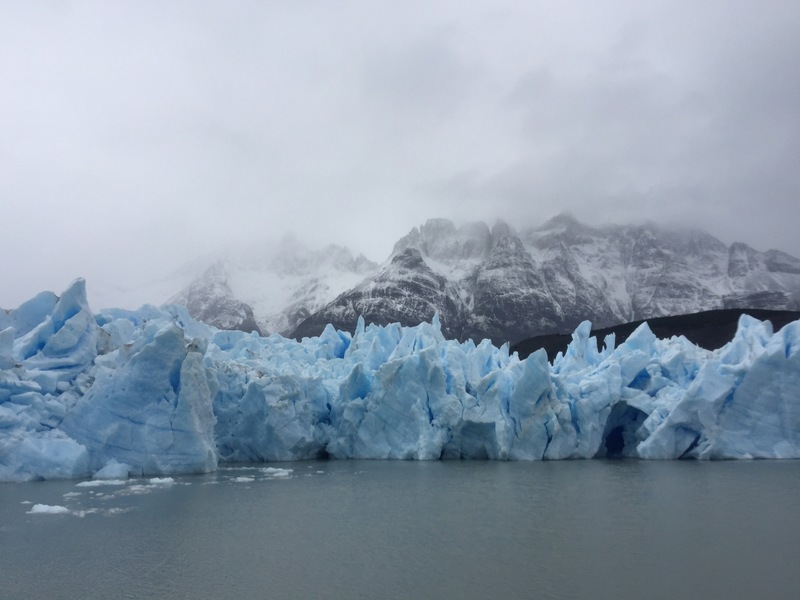 Compared to the straight walls of the Perito Moreno Glacier near El Chalten the Glacier Grey was much more asymmetric, produced many more ice chunks in the water and was more blue. The Grey II was late and slow, but eventually we made it down near Hotel Lago Grey drop off. 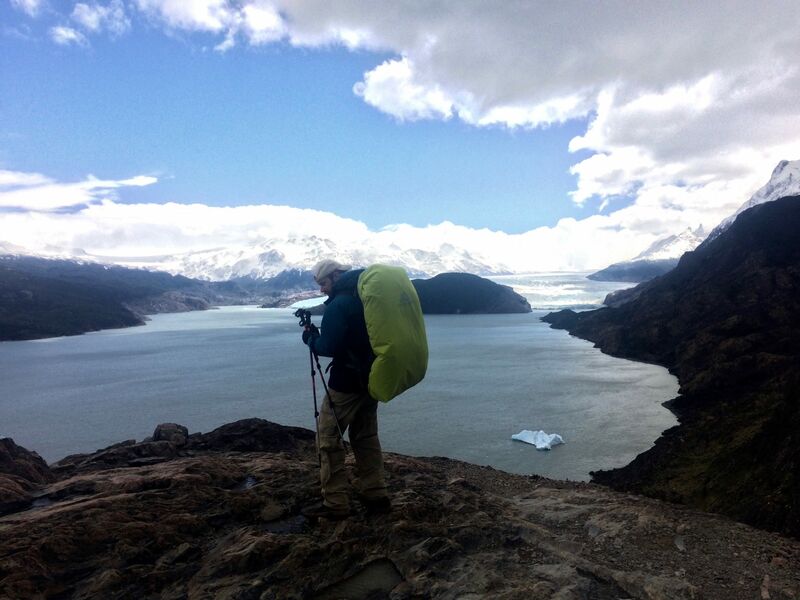 We arrived to a rocky beach with glorious views of the Torres Del Paine mountain range as a backdrop to the glacier lake and massive ice chunks at waters edge. Walking towards the parking lot we witnessed a chunk the size of a bus split off an ice hunk nearby. These experiences were well worth the large amounts of waiting around and transit this day. After this we hiked to Hotel Lago Grey and they thoughtfully made us a meal even though the kitchen was closed. These salmon, cream cheese, cucumber sandwiches (the only ingredients available) paired with fries and beer were delicious! After eating we transferred to the Center de Visitantes de Administration to wait for the park shuttle that arrived at 6pm. This 6pm bus then took us to the Cafeteria Pudeto were we waited a long while for the catamaran shuttle from Refugio Paine Grande. The last stop for our bus on the way out of the park was back at Laguna Amarga where others could hop off to get on their respective bus lines. Finally we were headed back to Puerto Natales. In all, we started our transit at noon getting aboard the Grey II and ended up in Puerto Natales to return our rental equipment just in time at 10pm. It was an amazing day, the end to an awe-striking trip.